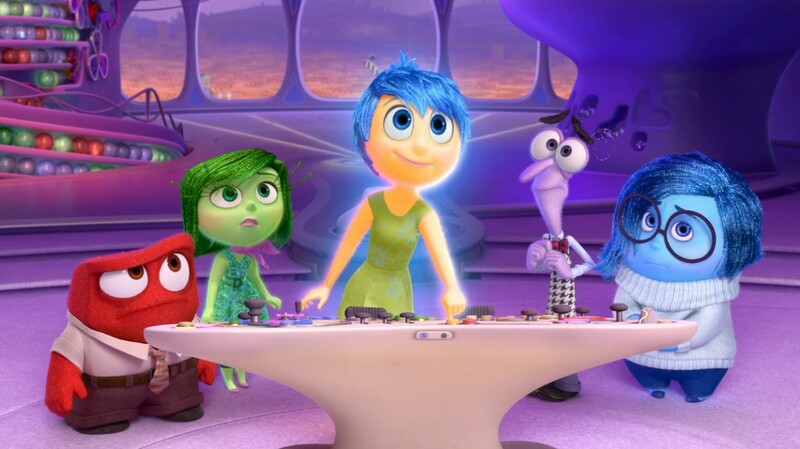 An animated drama-comedy about the inner workings of a young girl's brain, Inside Out pushes all the right emotional buttons but also suffers from Disney's frustratingly formulaic "journey" clichés. Riley Anderson (voice of Kaitlyn Dias) is a girl from Minnesota, and her brain headquarters is controlled by five emotions. The dominant Joy (Amy Poehler) does her best to keep Riley happy, but she is often hampered by Sadness (Phyllis Smith). They are supported by occasional interventions from the combustible Anger (Lewis Black), the perpetually frantic Fear (Bill Hader) and the snooty Disgust (Mindy Kaling). Riley grows into a generally happy child who loves hockey, her family, and friends, with Joy working hard to create and store mostly cheerful memories within Riley's brain. When Riley is eleven, her father (Kyle MacLachlan) and mother (Diane Lane) decide to relocate the family to San Francisco. This turns into a stressful experience, and Joy struggles to keep Riley positive. Sadness becomes more influential, and a struggle between her and Joy results in both of them inadvertently ejected out of the brain's headquarters and into the cavernous, complex areas of the brain where long-term memories and long-forgotten experiences are stored. Riley slips into a depression as Anger, Fear and Disgust unsuccessfully struggle to maintain control while Joy and Sadness embark on a complex journey to make their way back to HQ. A Disney / Pixar production directed by Pete Docter and Ronnie Del Carmen, Inside Out is a polished children's tale, aimed at the pre-teen market with enough edge and humour to also keep their parents well entertained. For the intended target, the premise is relatively original and the animation imaginative, with Riley's brain proving to be expansive, rich territory to house a story about what makes us human. Docter co-wrote the script, and does not shy away from some sensitive topics. The complications that come with major life changes, stressed parents unintentionally straining their kids, and the perils of depression come to the fore, and as much as Inside Out is a comedy, it offers avenues for serious conversations about somber challenges triggered by life's milestones. As a movie, the first half is by far stronger. Docter has breezy fun establishing Riley's emotional-drivers and the brain's workings, finding winning metaphors in shiny globes representing memories, a vault-like system for storing core, foundational events, and suspended islands that bring to life her various personalities. Joy is the tireless leader of Riley's emotions, the pursuit of happiness usually able to dominate other, less constructive emotions. Amy Poehler delivers a dedicated and energetic voice performance to convey Joy's irrepressible attitude. But the more serious second half gets bogged down in one of Disney's all-too-familiar journey treks, Joy and Sadness having to find their way back to HQ through the deep recesses of Riley's brain. Here events, locations and characters are much more hit-and-miss, long-lost imaginary friend Bing Bong (Richard Kind) only partially successful, a short-cut through an abstraction chamber missing the mark entirely, while a cut-out boyfriend image also drops in and out with little context. The film bogs down, intermittently tiresome and sometimes repetitive as Riley's personality islands suffer the effects of her dysfunctional emotions. 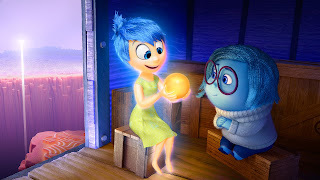 Regardless of some shortcomings, Inside Out deserves enormous credit for steering away from any kind of antagonist, both in Riley's real life and in her brain. There are no bad guys or villains; Riley's troubles are triggered by everyday events, her balance tipped by unintended pressures. The perils lie within, as do the solutions. And the film moves towards a clever, unexpected outcome, with a mature lesson about the complementary role of all that makes us function emotionally. Inside Out peeks inside the brain and finds familiar organized chaos helping to create moments both funny and sad, and fertile ground for the human process of emotional growth.